3 Bedroom Semi Detached House For Sale in Burnley for Offers Over £130,000. A perfect family home situated in a quiet tucked away position yet close to everything you need! 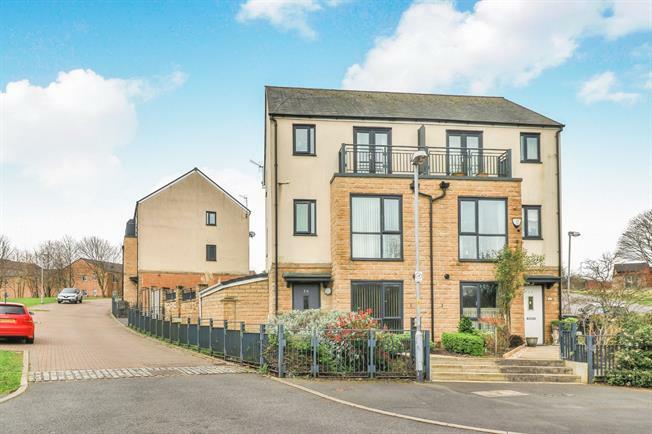 This modern semi detached home is beautifully presented throughout and offers deceptively spacious accommodation over three levels. Comprising entrance hallway, open plan kitchen/diner and lounge with French doors overlooking the garden on the ground floor. Two well proportioned bedrooms, study and bathroom on the first floor, the large master bedroom with dressing room and en suite on the second floor. The property benefits from the addition of a multi use room to the side with French doors out to the garden currently used as a utility room, private driveway parking and delightful rear enclosed private garden. Entrance is gained at the front of the property into the hallway. Radiator, ceiling light, stairs leading to the first floor and access into the dining kitchen. Double glazed uPVC window facing the front. Radiator, under stair storage cupboard, spotlights. Roll edge work surface, fitted wall and base units with contrasting breakfast bar, stainless steel one and a half bowl sink with mixer tap and drainer, integrated electric oven, integrated gas hob, over hob extractor, space for dishwasher and space for washing machine. French uPVC double glazed doors opening onto the patio and garden. Double aspect double glazed uPVC windows facing the rear overlooking the garden. Radiator, ceiling light. A really useful area used currently as a utility room however, could be used as multi purpose. French uPVC double glazed doors opening onto the patio and garden. Double aspect double glazed uPVC windows facing the front overlooking the garden. Ceiling light. Provision for washing machine and dryer. Double glazed uPVC window facing the side. Radiator, ceiling light, access to the bedrooms, bathroom and study area. Double aspect double glazed uPVC windows facing the rear overlooking the garden. Radiator, ceiling light. Radiator, ceiling light. Low level WC, panelled bath with mixer tap and thermostatic shower over, pedestal sink, extractor fan. Double glazed uPVC window facing the front providing delightful open aspect views. Radiator, ceiling light. Double glazed uPVC window facing the front providing open views. Ceiling light, stairs leading to the second floor. French double glazed doors opening onto a balcony offering lovely open aspect views. Double aspect double glazed uPVC windows facing the front and side. Radiator, ceiling light, open access to the dressing area and access into the en suite. Double glazed uPVC window with obscure glass facing the rear. Radiator, ceiling light. Low level WC, single enclosure cubicle and electric shower, pedestal sink, extractor fan.